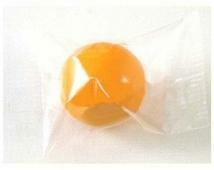 Imprinted small gumball in cello wrapper. Imprint area: 5/16" diameter. One small unimprinted gumball (approximately 5/8" assorted colors) wrapped in a clear or white cello wrapper with a one standard color imprint. 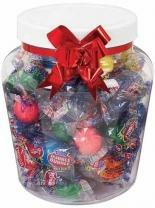 Imprint Area: GUMBALL: .35"D / WRAPPER: 1 3/4"W x 1/2"H. Additional Costs: Add'l colors add $50 setup, plus $.05 run charge. For imprinted gumballs, add $.10 to price, plus a $50 setup. Filled Carton: 10 1/2 x 10 1/2 x 11 5/8" Quantity Per Carton Filled: 1000 Carton Shipping Weight Filled: 6. Two small unimprinted gumballs (approximately 5/8" assorted colors) wrapped in a clear or white cello sleeve with a one standard color imprint. 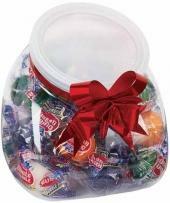 Imprint area: GUMBALL: .35"D / WRAPPER: 1 5/8"W x 1/2"H. Additional Costs: Add'l colors add $50 setup, plus $.05 run charge. For imprinted gumballs, add $.10 to price, plus a $50 setup (min. order 5000). Filled Carton: 10 1/2" x 10 1/2" x 11 5/8" Quantity Per Carton Filled: 1000 Carton Shipping Weight Filled: 12. Large gumball with an imprinted wrapper. Large gumballs are now available in either assorted colors or specific colors: white, yellow, orange, green, pink, blue, or red. One large unimprinted gumball (assorted or specific colors) wrapped in a clear or white cello wrapper with a one standard color imprint. The gumball varies in size - approximates 1" diameter. Imprint Area: Wrapper: 2 1/4"L x 1"H. Additional Costs: Add'l colors add $50 setup, plus $.05 run charge. For imprinted gumballs, add $.10 to price, plus a $50 setup. Filled Carton: 10 1/2" x 10 1/2" x 11 5/8" Quantity Per Carton Filled: 1000 Carton Shipping Weight Filled: 20. Four small unimprinted gumballs (approximately 5/8" assorted colors) wrapped in a clear or white cello wrapper with a one standard color imprint. Imprint area: 3"W x 5/16"H. Additional Costs: Add'l colors add $50 setup, plus $.05 run charge. For imprinted gumballs, add $.20 to price, plus a $50 setup. Filled Carton: 10 1/2" x 10 1/2" x 11 5/8" Quantity Per Carton Filled: 500 Carton Shipping Weight Filled: 11. Header card promo pack with a one to 4 color process imprint (on both sides of white card) glued to the top of the bag. The bag is heat sealed and filled with 0.5 oz. of your favorite filler. Imprint Area: Front: 3 1/2"W x 1 1/2"H; Back: 3 1/2"W x 1"H (back of card lists ingredients). Custom 6 piece stick gum pack (spearmint flavor) with a one standard color imprint on the white overwrap (retail graphics on pack and gum inside sealed pack are not removed). For gold or silver foil wrapper, add $.10. Imprint Area: 3 11/16"W X 7/8"H Filled Carton: 10 1/2" x 10 1/2" x 11 5/8" Quantity Per Carton Filled: 400 Carton Shipping Weight Filled: 19lbs. 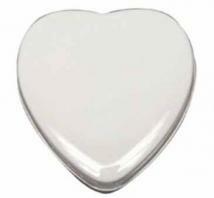 This upscale heart shaped tin is printed with either a high gloss laminated four color process decal with full bleed, or a one color direct imprint. Tins can be filled with peppermints, spearmints, sugar free mints, candy cinnamon red hots, or mini chocolate littles (m&m type). See pricing for these filling options. 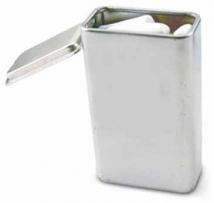 Our tins are great for tradeshows, sales person leave behinds, new product introductions, employee appreciation, etc. Your name, logo and message will travel with your customers and prospects like a miniature billboard. Dimensions: 1-3/4" H x 1-3/4" W x 3/4" D Decal Size: 1.625" sq. 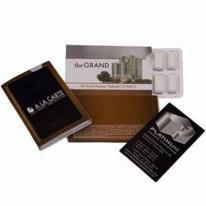 Direct Imprint Size: 1.470" x 1.454". Custom 12 piece sugar free peppermint or spearmint Stick N' Go gum pack with a one to 4 color process imprint on the sleeve with an adhesive tab to affix a business card or coupon. Imprint Area: FRONT: 3 1/4"W x 2"H Filled Carton: 15" x 15" x 10" Quantity Per Carton Filled: 500 Carton Shipping Weight Filled: 31. Custom printed envelope. Clear cello bag. Your choice of A, B or C fills. (A=BB1110 & C=BB1130) 4 Color Process. Note: Pricing shown is for B fills. Other fills available, please call for details and pricing. No running charges. Re-order set-up charge $45.00 Note: No less than minimum. Absolute Minimum Order Quantity: 250. B Fills: Candy Corn, Choc Covered Peanuts, Choc Covered Rasins, Gum Balls, Gummy Bears, Gummy Worms, Pistachios, Runts, Sour Patch Kids, Supermints, Swedish Fish, Teenie Beenies, Trail Mix. 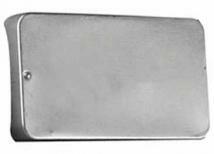 Item Size: 3" W x 5" H Max Imprint Area: 3" W x 1 1/2" H. Wt_100: 8 lbs. 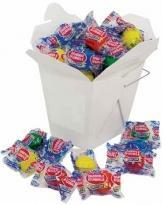 Webblets small fruit flavored gum tamper resistance. Product Size: 3" Diameter Imprint Size: 2-1/4" Diameter Additional Colors: (50)$0.60, (100)$0.45, (250)$0.40, (500)$0.35 Packaging: Bulk. Compact and convenient, the tray slides out of the case for easy access to sugar-free mints or sugar-free gum. Available in 2 colors. Gum Flavors : Peppermint, Spearmint, Cinnamon Size : 3-1/8"w x 1-1/2"h Imprint Area : 1-1/2"w x 1-1/2"h Additional Colors: (50)$0.60, (100)$0.45, (250)$0.40, (500)$0.35 Packaging : Bulk (Individually shrink wrapped). Other decoration methods are available for this item, please call. The hinged lid on this tin makes it easy to use. It can be reused for carrying or storing other small items, keeping your message alive in the future. Fill it with your choice of Sugar Free: Mints, Sport Mints (Golf, Tennis, Football, Basketball, Soccer) Contact us for information about other fills Size : 1-7/8\"w x 2-3/8\"h Imprint Area : 1-1/4\"w x 1-1/2\"h Packaging : Bulk. Mix-N-Match Candy 4 color process printing at no additional cost. Made in the USA. Size: W: 2-3/4" x H: 3-1/2" x D: 3-5/8" Imprint Size: Label: W: 2" x H: 2" Packaging: Bulk Ship Weight: 50 QTY/ 18 LBS Carton Size: 16x12x12. Rounded Rectangular Tin with Gum Flavors : Peppermint, Spearmint, Cinnamon. 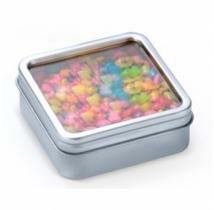 Rounded rectangular candy tin filled with sugar-free gum. Available in 2 colors. Gum Flavors : Peppermint, Spearmint, Cinnamon Size : 3-3/8"w x 1-1/2"h Imprint Area : 2-1/2"w x 1"h Additional Colors: (50)$0.60, (100)$0.45, (250)$0.40, (500)$0.35, (1000)$0.30 Packaging : Bulk. 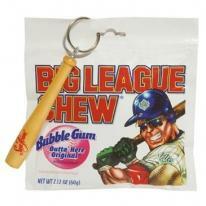 Always a home run, comes with Big League Chew bubble gum & a mini baseball bat key chain. Imprint Size Bat : 1 1/4"X 3/8"; Tag: 1 1/2"X 1". Note: Additional color available, call for pricing. 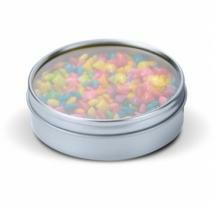 Large clicker tin filled with sugar free mints or sugar free gum. Shrink wrapped for tamper resistance. 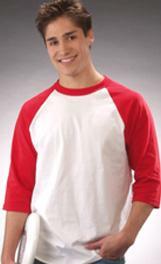 Available in 2 colors White tin is available with Heat Transfer imprint. Contact factory for info. Gum Flavors : Peppermint, Spearmint, Cinnamon Size : 3" Diameter Imprint Size : 2-5/8" Diameter Additional Colors: (50)$0.60, (100)$0.45, (250)$0.40, (500)$0.35 Packaging : Bulk. Other decoration methods are available for this item, please call. Resealable 18 oz. gumball bag with stock graphics - no customization. 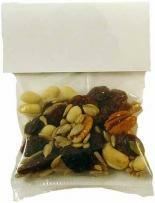 Filled Carton: 16" x 10" x 7" Quantity Per Carton Filled: 12 Carton Shipping Weight Filled: 15. Made in the US Holds 19 fluid ounces Ribbon can be provided with upcharge. Size: W 3 3/4" X H 4 1/4" Imprint Size: CAP 2" DIA Packaging: Gift Box Ship Weight: 50 QTY/ 24 LBS Carton Size: 16x12x12. Made in the US Holds 45 fluid ounces Ribbon can be provided with upcharge. Size: W: 4 3/4" X H 5 5/8" Imprint Size: 2 1/2" DIA Packaging: Gift Box Ship Weight: 50 QTY/ 54 LBS Carton Size: 20x20x12. 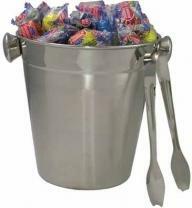 Made in the US Mix-N-Match Candy Stainless Ice Bucket with Tongs. Size: W: 6-1/2" x H: 5-7/8" Imprint Size: 2-1/2" dia Packaging: Gift Box Ship Weight: 25 QTY/ 25 LBS Carton Size: 20x20x12. Assorted small gumballs. 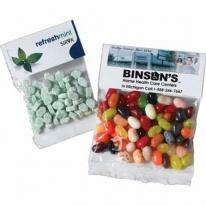 Assorted small gumballs with a black or white imprint. Packed in a poly bag with a white tape seal (clear cello bag that is heat sealed at high quantities). Imprint areaa for gumballs: 5/16" D.